These amazing pictures show a killer whale attacking and killing a female dolphin and her pup in front of tourists on a nature watching cruise. 29 Mar 2010. 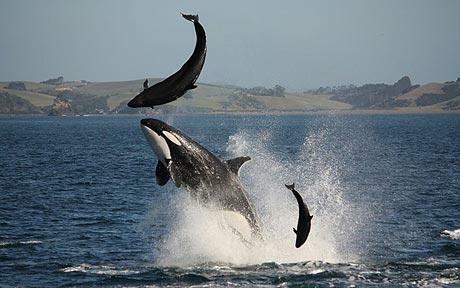 The orca (killer whale) was in party of a pod of about eight whales which targeted a larger number of smaller dolphins, known as false killer whales or pseudo orcas. Tommy Hatwell, a wildlife photographer, watched as one of the whales, a female, attacked one of the dolphins, a female with her young pup, eventually tossing her into the air and snapping her back. The attack happened at a seaside beauty spot called Black Rocks, in the Bay of Islands, New Zealand. Rob Hunt, a company boss, said the event was a “one in a million” chance. He said markings showed it was a female killer whale that chased the doomed dolphin after apparently singling it out. “It chased it for several minutes, playing with it before flicking the unfortunate creature about 10 metres into the air, then breaking its back on her nose. “We have been in operation for a little over two years and take on average 400 photos of wildlife a day in addition to tourists interacting with nature. “I have never known anything like this before to be captured on film. This is mother nature at its most brutal, a rare occurrence that it was seen by humans, and even more rare that it was captured on camera. “It is very real when you see these photos of just how fierce killer whales are. Pseudo orcas are a very rare species of dolphin and there is only one known pod in New Zealand. She added: “In New Zealand, for two species to be in the same place at the same time is very rare.